Deciding which student desks you need in the classroom is not an easy task. There are so many styles to consider, and the right classroom desk really depends on what you are teaching and to whom. So what kinds of school desks are there? There are classic models, combo desks and tablet arm desks - and that&apos;s just the beginning. In addition to choosing the style of your school desks, there are a number of different surface materials to choose from. When you purchase from Hertz Furniture, you can rest assured that you are making a great choice no matter which classroom desks make the final cut. What is the best school desk surface material? The most important material to consider when purchasing a student desk is the work surface. If you are looking for a low-budget option, high-pressure laminate is smooth and offers basic damage resistance, but will begin to show wear and tear through the years. Hard plastic is scratch- and stain-resistant, easy to clean, and often includes a convenient pencil groove. Hard plastic desktops will stand up to years of student use- and abuse. A third option is Hertz Furniture&apos;s exclusive WoodStone desktops. WoodStone is produced by Academia. It has the same damage resistance and easy cleaning as hard plastic, but costs and weighs much less. If you are looking for the most durable, budget-friendly option, WoodStone is the way to go. What are student desk frames made of? 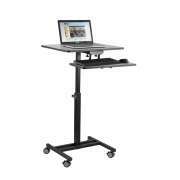 A strong desktop needs sturdy support, and that is what the desk frame is for. It is a good idea to check if the models you are looking at have steel frames, and if so, of what gauge. Although a 16-gauge steel frame is stronger than an 18-gauge steel frame, you might decide that you don&apos;t require the higher degree of toughness. In addition to the steel gauge, the frame may also have a U-brace for added reinforcement. U-braces make desk frames much stronger. Some school desks have unitized frames. Unitized frames can stand freely; they are not held together by a desktop or bookbox. Classroom desk legs come in a selection of styles. 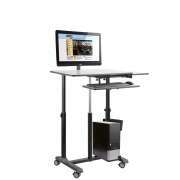 Adjustable-height legs can suit students of different sizes. They enable you to provide all students with a perfectly-fit desk, and give you the flexibility to change around your school furniture among various classrooms and grades. Classic four-legged school desk models are available as well as T-leg, the three-legged Innovation model, and sled-based combo desks. Should I get student desks with bookboxes or bookbaskets? Students are sure to appreciate the convenience of built-in accessible storage. When you are looking at school desks for sale, this factor should definitely be taken into account. Book-boxes can be made out of metal or plastic and rest just underneath the desktop. They store binders, notebooks, textbooks, school supplies and more. If there is a concern of open storage becoming a distraction during class, lift-lid book-boxes are an easy solution. They offer the same accessibility and convenience but will prevent students from playing becoming distracted by desk contents during class. Combo desks offer the book-basket alternative. Wire-mesh book-baskets can rest directly underneath attached chairs. They keep books, notebooks, and anything else students need within reach yet out of sight. What is the best color for a classroom desk? Once the structural features of a desk are considered, you can move on to stylistic aspects. All desktop materials are available in a choice of colors. If you are looking for that extra splash of vibrancy or coordination, Educational Edge desks have colored edge banding that can be coordinated with your classroom. Another excellent choice is the Inspiration school desk, which has a coordinated bookbox and boot-glide color. What kind of teachers desk should I get? When considering the optimal desks for students, don&apos;t forget to accommodate their teachers. Whether you are in a private school, public school or a charter school with uniforms, your teachers need a proper space to work in. The teacher&apos;s desk is an important piece of classroom furniture. Hertz Furniture offers teacher&apos;s desks in a variety of styles, that can suit any budget. Teacher&apos;s desks are available with different drawer configurations, materials and work surface sizes. Overwhelmed by all of the classroom desk options and considerations? Hertz Furniture is here to help you with a huge selection and great advice that is just a phone call away. No matter what size your classroom is, how many students you have, or what your budget is, Hertz Furniture will help you find the optimal solution for your needs.